I love this place. In and out fast. Thank you for sharing your review. We aim to please when it comes to convenience. Please let us know if there is anything else we can do to accommodate your storage rental needs! I'm very busy and love the ease of a 24 hour kiosk that was quick, and easy to use. 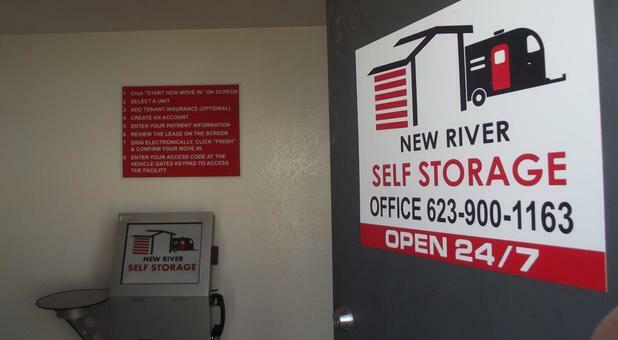 This is by far the best storage facility in the New River area and you can't beat the rate for what they provide. Would absolutely recommend to anyone looking for a secure and affordable storage facility. Thank you so much for recommending our facility to others. All of our renters are important to us and we are very pleased to know that you found the process easy to use and affordable! I searched everywhere for a good storage unit and finally found this one. First off, the website was easy to use and had all of the information I needed. I've never used a storage unit before and most of them seem sketchy. This place is secure, easy to use and reasonably priced. I would recommend it to anyone looking for a storage facility. Thank you for recommending our facility to others and for a 5 star rating! We are glad that you your first storage unit rental experience was a great one! If there is anything we can assist with moving forward, please feel free to contact us! Easy, Simple and Secure! The ease of getting in and getting out of my unit is great because of the setup. From using the Kiosk to the 24/7 access, I can bring my toys and belongings back to storage at any time of day or night and feel confident that they will be well stored. My items do not cook in the unit from heat, and they stay fresh and dry through storms. The great price makes storing my items here well worth it, and it keeps them out of my garage. This is a top notch facility that I know I can trust! Thank you for taking the time to review your rental experience with us. We are very pleased to hear that our staff and our facility amenities have made your rental experience a pleasant one! The kiosk and call center are super convenient. Easy to access my unit, which didn't get cooked in this summer's heat! Secure, affordable and easy access. Thank you for your positive comments. We are so glad to know that it was easily accessible to you and that you have enjoyed renting from us!